The goal of this paper is to describe simple methods that will greatly aid in the setup and analysis of mouse lungs with lung cancer or other pathologies. We present 3 protocols to simply and reliably carry out lung instillations, fixation, and lung volume measurements. The ability to instill live agents, cells, or chemicals directly into the lung without injuring or killing the mice is an important tool in lung cancer research. Although there are a number of methods that have been published showing how to intubate mice for pulmonary function measurements, none are without potential problems for rapid tracheal instillation in large cohorts of mice. In the present paper, a simple and quick method is described that enables an investigator to carry out such instillations in an efficient manner. The method does not require any special tools or lighting and can be learned with very little practice. It involves anesthetizing a mouse, making a small incision in the neck to visualize the trachea, and then inserting an intravenous catheter directly. The small incision is quickly closed with tissue adhesive, and the mice are allowed to recover. A skilled student or technician can do instillations at an average rate of 2 min/mouse. Once the cancer is established, there is frequently a need for quantitative histologic analysis of the lungs. Traditionally pathologists usually do not bother to standardize lung inflation during fixation, and analyses are often based on a scoring system that can be quite subjective. While this may sometime be sufficiently adequate for gross estimates of the size of a lung tumor, any proper stereological quantification of lung structure or cells requires a reproducible fixation procedure and subsequent lung volume measurement. Here we describe simple reliable procedures for both fixing the lungs under pressure and then accurately measuring the fixed lung volume. The only requirement is a laboratory balance that is accurate over a range of 1 mg–300 g. The procedures presented here thus could greatly improve the ability to create, treat, and analyze lung cancers in mice. For a number of reasons, lung cancer has not been widely studied in the mouse. One reason for this is that access to the lung is very difficult in vivo, and quantitative analysis of fixed lungs is not commonly done. The methods described in this paper are designed to remedy this situation. The goals herein are to describe simple methods that will greatly aid in the setup and analysis of mouse lungs with lung cancer or other pathologies. While none of these approaches are entirely new, they have not been presented together as stand-alone methods in the simplified manner as described here. There have been a number of manuscripts that have described methods for intubation of the mouse lung primarily for the purpose of doing repeat pulmonary function or bronchoalveolar lavage in individual mice in longitudinal studies. Since that original paper, there have been several other papers that have described different approaches to mouse intubation1-9. While all of these methods can be used successfully, they usually require considerable training, and are often not without a nontrivial failure rate. In addition, in order to carry out pulmonary function measurements, the cannula needs to fit the trachea tightly enough so that there is no air leakage. However, another practical use for intubation is to deliver specific agents (cancer cells or other insults) or therapeutic drugs directly to the lung. Such a procedure does not require a tight fitting cannula nor any sophisticated pulmonary function equipment. The novel feature of this method shown here involves a minor surgical procedure that allows the intubation without any possibility of the cannula entering the esophagus. This simple approach enables successful intubation with relatively little training or experience. As many as 30 mice/hr can be treated using this approach with a failure rate approaching zero. Once the mice are ready to be sacrificed, the injured or cancerous lungs can then be removed for histologic and pathologic analysis. However, in order to properly quantify any histologic variables for comparison with other lungs, it is essential to standardize the fixation procedures and properly quantify the fixed lung volume10. This paper describes in detail the simple procedures that allow standardized fixation procedures as well as a way to measure the fixed lung volume. The volume is an essential metric in the quantification of the histology, since without such a volume determination, only relative densities can be measured10. Once the lung volume is known, however, absolute measurements of cells and other structural measurements in the lung can then be quantified. The following protocol describes a system that works well in 20–35 g mice. The method could easily be adaptable to larger or smaller mice simply by changing the catheter size. All animal protocols were approved by the Johns Hopkins University Animal Care and Use Committee. Select a commercial one-inch long 20 g intravenous cannula to use for the intubation. Modify the catheter tip manually bending it to generate a slight curvature at the tip as illustrated in Figure 1. Anesthetize the mouse with a mixture of ketamine (100 mg/kg) and xylazine (15 mg/kg) injected IP, and confirm anesthesia by the absence of reflex motion. Apply veterinary ointment on the eyes immediately after anesthesia. Immediately after anesthesia apply veterinary ointment on the eyes and give carprofen (5-10 mg/kg SQ) for post surgical and instillation analgesia. Place the mouse supine on a sloped platform. As shown in Figure 2, a large office binder with suture loops taped on works perfectly well. Shave the ventral part of the neck and clean and disinfect the neck area with 70% alcohol. With new latex- and powder- free gloves, use surgical instruments disinfected with 70% alcohol. Using sharp scissors make a small surgical incision in the neck approximately 12 mm below the lower incisor. With a forceps gently pull the skin in the neck caudally until the ventral wall of the trachea can be seen. Gently retract the tongue and insert the cannula with the bent tip tilted toward the ventral surface of the mouse. As in 1.4, pull gently on the skin in the neck, and insert the cannula into the trachea. NOTE: With a little practice, the catheter will be visible moving down the trachea. If it goes in the esophagus, then there will be no visual sighting of the catheter’s movement. No incisions are made in the trachea. Once the catheter is seen in the trachea in the neck, advanced it about 5 mm to be reliably passed the vocal cords but still well above the carina. Prepare to instill up to 50 µl of liquid by injecting through the catheter with a gel loading pipette tip. Place the tip in the luer hub, but before injecting look carefully to observe movement of the fluid in the tip synchronous with the mouse’s breathing. Then inject the instillate. With a 1 ml syringe, immediately do a relatively rapid inflation of 0.6 ml of air into the lungs through the catheter to help distribute the liquid deep in the lungs. Remove the cannula. Use a small amount of cyanoacrylate adhesive to close the small surgical wound as per package insert instructions for VetBond. Place mice in individual cages and visually monitor them until they wake up and behave normally without any indication of discomfort. NOTE: Once all experimental procedures are done in a mouse, the lungs can be readied for histologic processing by fixation with formaldehyde (or any other desired fixative). Sacrifice the mouse with an IACUC acceptable procedure. For the representative mouse shown in the video, cervical dislocation of an anesthetized mouse is used. Perform a tracheostomy (if not already done) by surgically exposing the ventral side of trachea, making a small cut, and inserting an 18 G stub needle tip into the trachea, and tying it with thread. Carefully open the thorax with a midline incision, cut away the diaphragm, and remove the lateral chest walls to expose the lungs. Connect the luer end of the needle to a reservoir on a ring stand containing formaldehyde. See Figure 3. Set the top surface of the formaldehyde 25 cm above the level of the mouse. See Figure 3. Next make sure there is no air in the fixation tubing by running fluid out the end of a stopcock. Connect the luer end of the tracheal cannula to the reservoir tubing. Open the stopcock to inflate the lungs with the formaldehyde. Leave the lungs under pressure for at least 20 min. Open the stopcock to inflate the lungs with the formaldehyde. Leave the lungs under pressure for at least 20 min. Next, tie off the trachea beyond the end of the stub needle. It may help to pull back slowly on the needle to expose more of the uncannulated trachea. When tied securely, remove the stopcock. Carefully dissect out the lungs. Place the lungs in formaldehyde overnight. Longer times are fine, and some stains or procedures may specify specific times. Also any other liquid fixatives, such as z-fix can be used for the instillation and immersion. Before further histologic processing, measure the fixed lung volume as described next. Measure the lung volume using Archimedes principle as illustrated in Figure 4. Remove the fixed lung from the formaldehyde and dissect the heart and any other non-lung tissue. Use a previously constructed simple homemade wire support device that is used to keep the lungs fully under water. NOTE: This device needs to be made compatible with whichever balance is being used. A typical device shown in Figure 5 is made from plastic pipettes and thin (20 G) wire. 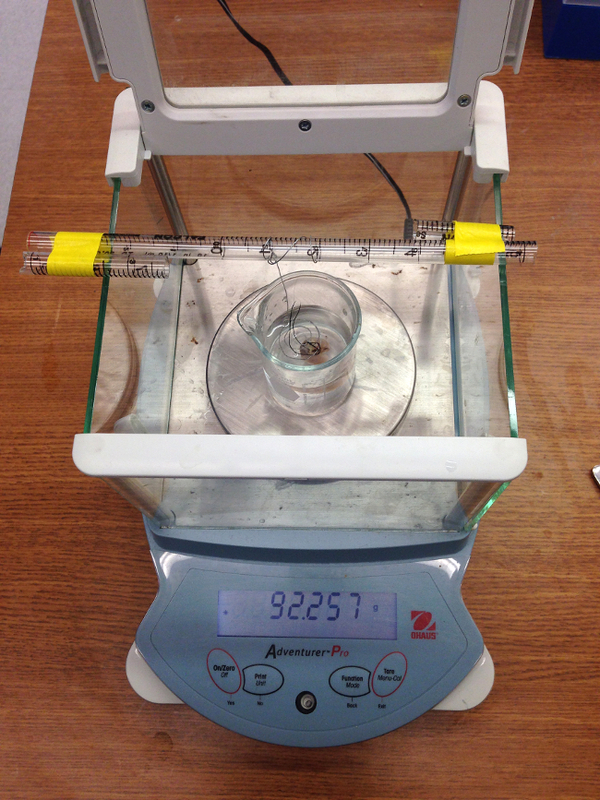 This system works well with the balance used in the video, but could easily be adapted to most laboratory balances. 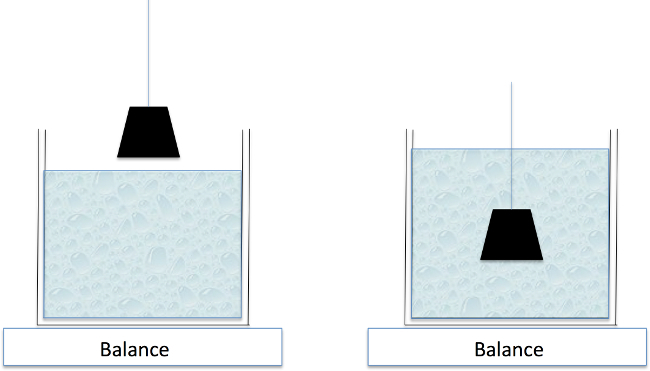 Place a beaker with ≈200 ml of water on the balance and tare with the supporting cage in place in the water. See Figure 6. Remove the metal cage; place the lung on the water surface and press under water with the cage. Record the weight on the balance. This number reflects the volume of water displaced and is thus a direct measure of the lung volume. Be careful to make sure the lung or suture or any part of the wire cage does not touch the sides or bottom of the beaker. For accuracy, repeat this measurement. Remove the lung from the water, and dry on a tissue. Tare the beaker with cage in place again and repeat the lung volume measurement. The two volume measurements should then be averaged. NOTE: If the lungs are left in the formalin for more than about a week, the air in the lungs will be dissolved in the liquid. When this happens, the lung will sink, so it is no longer necessary to use any device as in Figure 5 to keep the lung submerged. In such case the volume can be measured by simply by holding the lung by one of the suture strings until it is completely submerged as illustrated in Figure 4. The procedure describe in the first protocol does not by itself lead to any generalized results. It only describes a very reliable means to instill substances directly into the trachea. 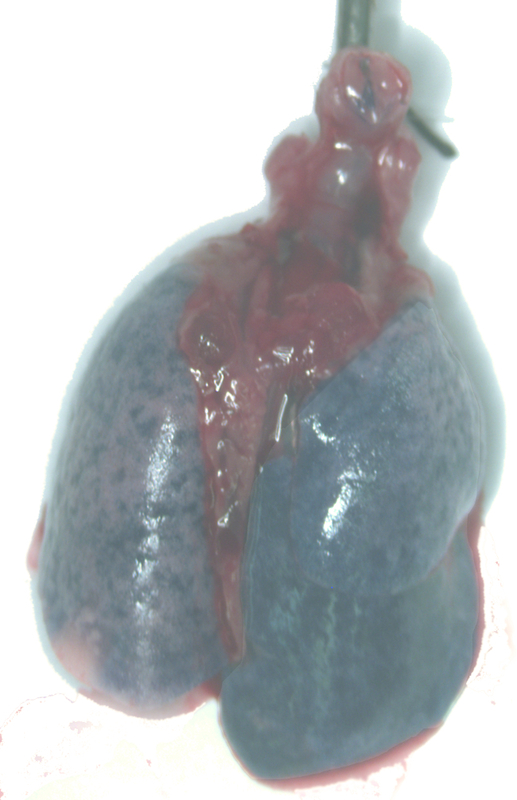 Figure 7 shows an example of a lung in which trypan blue was instilled with the method described here. There is widespread distribution of the dye, similar to what has been seen with other dyes or tracers given directly into the trachea or mice11,12. We have also used this method to deliver either bleomycin or elastase to the lung, which results in widespread fibrosis or emphysema, respectively. The procedures described for quantifying the structural changes in postmortem lungs provide data on the lung volumes fixed at a pressure of 25 cm H2O. Such volume measurements are essential to convert subsequent unbiased histologic measurements of cell or tissue densities into total numbers10. This paper only describes the means to obtain a very accurate lung volume. In nine 10–12 week old healthy Balb/c mice we measured a mean (± SD) fixed lung volume of 0.82 ± 0.09 ml with the left lung volume being about 30% of the total. In Balb/c mice given 3 U of pancreatic elastase (with the method described in this paper) to generate experimental emphysema, the lung fixed volume increased to 1.15 ± 0.13 ml, with the left lung fraction remaining at 30%. Figure 1: Intravenous catheter with slightly curved tip used for instillation. 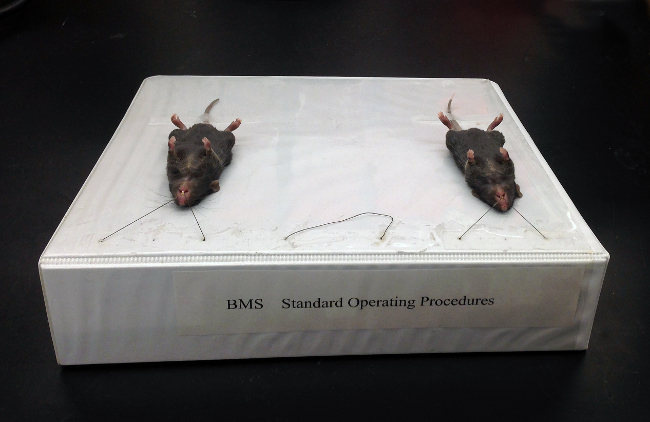 Figure 2: Sloped 3-ring binder used to support mice for the intubation. This binder set up to hold 3 mice. 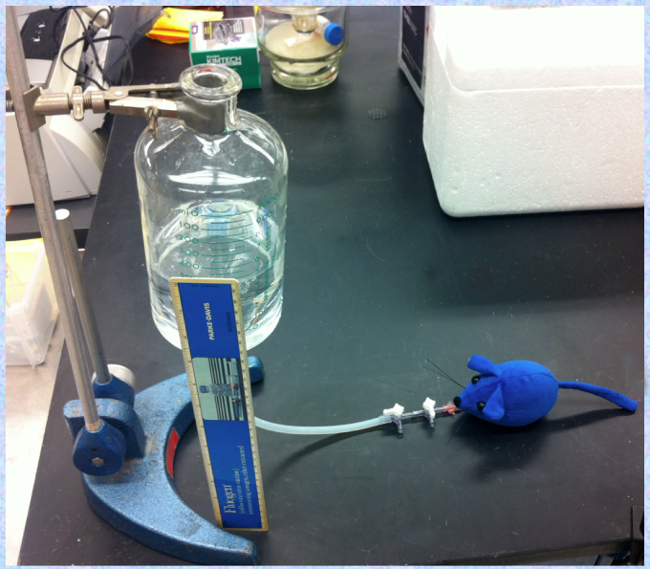 Figure 3: Formalin filled reservoir on ring stand connected to mouse, with top of fluid set 25 cm above the mouse. This fixation should normally be done in a fume hood. Figure 4: Archimedes Principle. The weight of water displaced by a submerged object equals the volume of the object. Because the lung normally retains some residual air, a device as in Figure 5 is needed to keep the lung fully submerged. Figure 5: Lab made support for keeping lungs completely underwater. 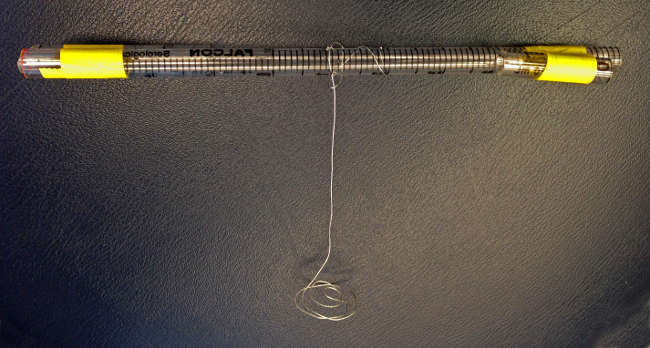 Device constructed from plastic pipettes and metal wire. Figure 6: Laboratory balance with beaker and tared submersion device ready for lung volume measurement. Figure 7: Example of a lung given trypan blue through the intubation catheter. The procedures described here have several advantages. First the required equipment is simple and inexpensive. Second, the intubation can be quickly done with few errors. Third, the ability to fix the lungs at a constant pressure, and then measure the fixed lung volume allows proper quantification of structures or cells in the lung10. One possible downside to the intubation is the minor surgery. This may limit the ability to repeat the procedure if a 2nd instillation is required. However, with careful surgery and application of the adhesive we have been able to routinely do a second instillation a week or two later. If continuous repeated instillations are required or if repeated pulmonary function tests are needed, another intubation approach may be more desirable13,14. In doing the instillation, there are several practical issues that should be mentioned. It is important to be as gentle as possible with movement of the tongue in the initial opening of the mouth. If forceps are used, the tips should be covered with rubber tubing, since it is easy to injure the tongue, and this can lead to death of the mouse. Although the methods here were designed for intubation of mice older than 6 weeks, they could easily be adapted to younger mice. Our instillation procedure was initially designed as an alternative to the method of oropharyngeal aspiration11. While this latter method can be easily learned, the actual volume delivered to the lung remains uncertain, since some of the instillate remains in the pharynx and gets swallowed. With a direct instillation into the trachea and subsequent lung inflation as we demonstrate here, the instillate is directly delivered to the lung. It is worth noting that, although it is possible to use intubation to deliver substances directly to the trachea11,12, such intubation can damage the upper airway or vocal chords, and in general requires a much higher level of training to ensure the 100% success rate that our procedure allows. The fixation procedure we describe is similar to what many investigators use. There is often some variability in the inflation pressure used for the fixative, but we feel that 25 cm H2O is a reasonable compromise that keeps the lung fully inflated without possible damage from over-inflation. It should be noted, however, that although it may seem that a lung inflated with fluid to 25 cm H2O should be at a volume close to what the total lung capacity might be with air inflation at 35 cm H2O, this is far from truth. In fact, the inflation with fixative generally results in a volume at 70% of the air lung capacity15,16. And with subsequent processing with paraffin embedding, the effective lung volume viewed in histologic sections is likely below functional residual capacity (FRC). The most common fixative is formalin or z-fix, but for immunologic staining, a glutaraldehye mixture is often required. Investigators will need to choose a fixative depending on what is needing to be stained, but further discussion of the optimal fixative is beyond the scope of this methods paper. In order to do proper quantitative analysis of histologic sections it is essential to have a measurement of lung volume10. Although it is possible to get lung volume from the complete sequence of serial sections (the Cavalieri method), in mouse lungs it is often simpler to simply measure the fixed lung volume as we have described in this document and video. The procedure we describe takes just seconds to do and should be routinely done with all lung fixations. Keep in mind, however, that the volume thus measured does not account for any shrinkage with subsequent processing and embedding, and if this is important, the Cavalieri method should be used. One final note regarding this fixed volume measurement is that the fraction of the lung volume in the left lung in the fixed lungs is significantly smaller than that which has been measured in vivo. CT imaging of the lungs in vivo of two strains of mice at functional residual capacity showed the left lung to be about 40% of the total17, whereas it is generally only 30% in the above measurements from lungs fixed at 25 cm H2O. At the present time, we do not understand why this should be so different, but it should be kept in mind when analyzing changes in quantitative histologic analyses. With regard to studies of lung cancer, having a measurement of lung volume enables an investigator to properly normalize data on specific chemical desnsities or the density of various cell types to absolute numbers in the whole tumor or whole lung. In summary, the intubation procedure describe here is inexpensive to fabricate and simple to use, and it should enable most investigators and laboratory technicians to quickly learn to successfully instill liquids into mouse lungs with relatively little experience. In addition, the fixation procedures and lung volume measurement for histologic analysis of lungs provide a means for proper repeatable and quantitative analysis of lung cells and lung structure.